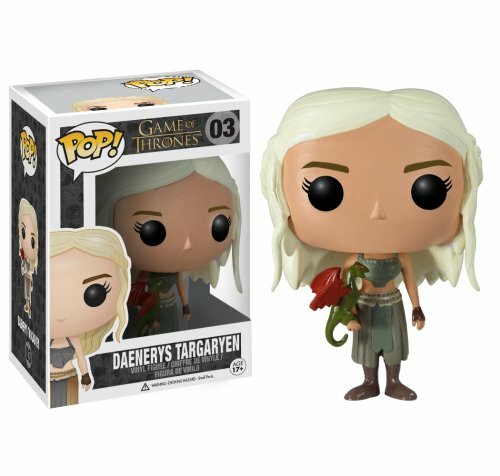 Do you love the Game of Thrones tv show or need to buy a gift for someone who does? 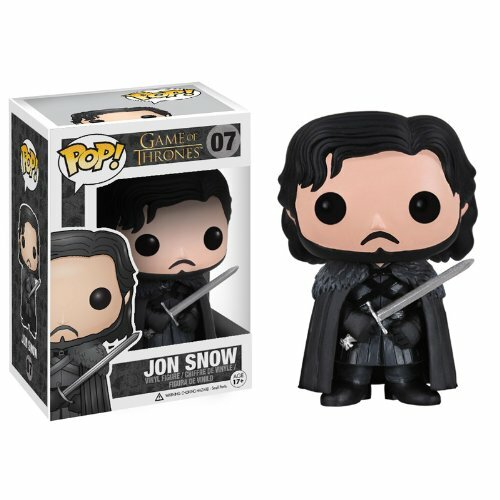 Well, today I bring you some great gift ideas – both fun and serious – for the Game of Thrones fan in your life. 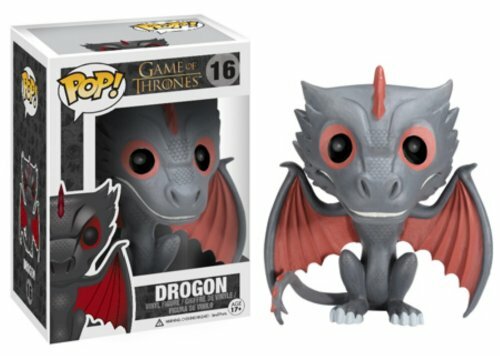 I’ll admit that I haven’t seen the tv show yet – I did read the first book many years ago though but got fed up waiting for the second one! 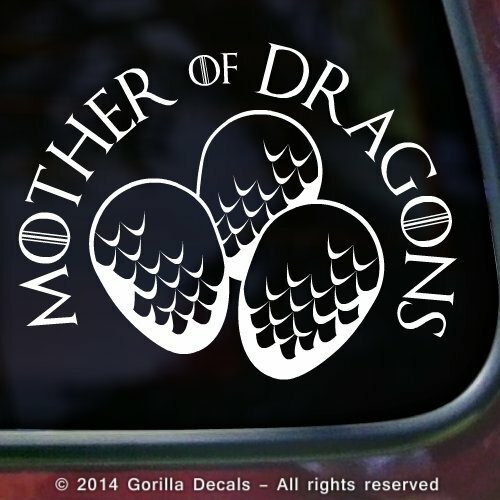 Rather like Robert Jordan’s Wheel of Time series or the Clan of the Cave Bear series, author George R. R. Martin has an epic story in his head and we just have to be patient and wait for him to get it all on paper! Frustrating though! 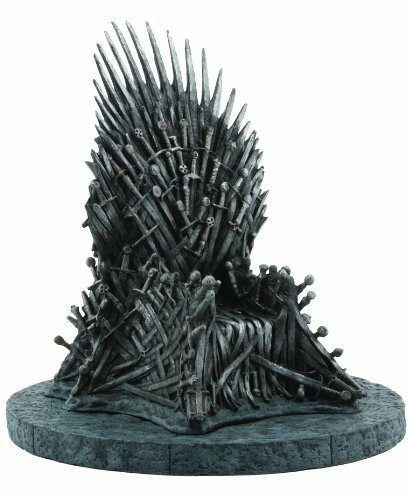 First up is this amazingly detailed 7inch replica of the iconic Iron Throne. 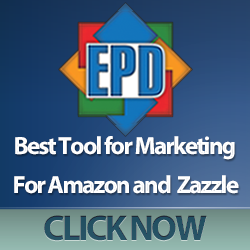 It looks incredible in the pictures on Amazon and the reviews are overwhelmingly positive. 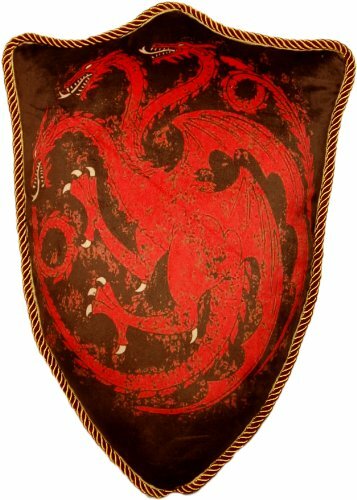 What a great gift for any fan of Game of Thrones or The Song of Ice and Fire books. There were surprisingly few unusual t-shirts available – many were just images from the tv show which is fine but I wanted to find something different to show you. 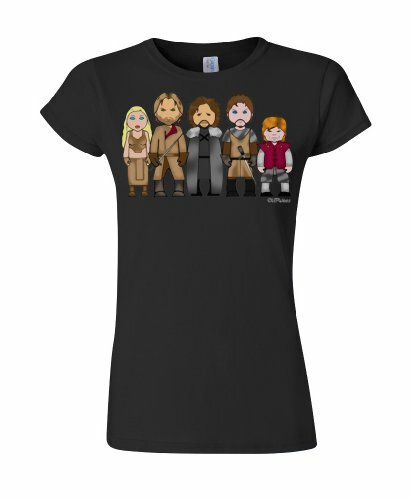 I love the cartoon style design of the Throne of the Seven Kingdoms t-shirt – each character is recognizable but nothing like the standard image we have of them. 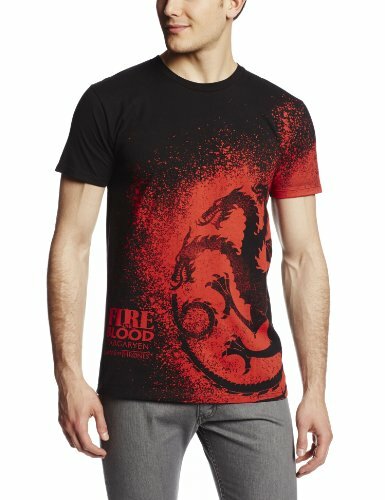 The Fire & Blood t-shirt is striking with it’s red Targaryen sigil design against the black background. 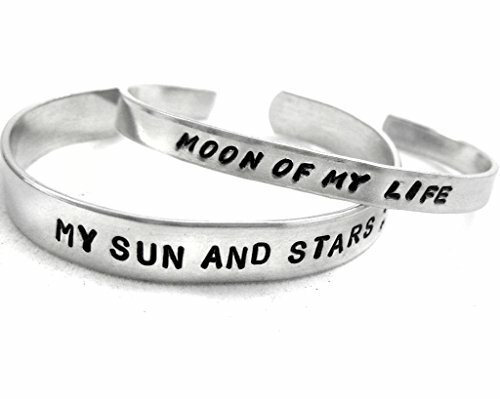 I love the simplicity of the Moon and Sun matching cuffs – the love story of Drogo & Dany expressed in two simple phrases. And yes, I’m a big softie and I know it! 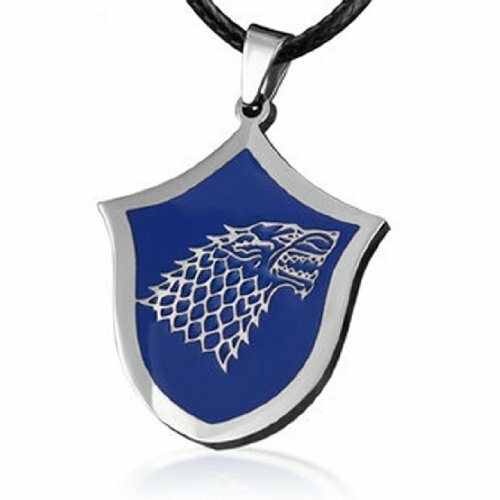 The House of Stark wolf pendant and Cersei’s Lion pendant are both beautiful but very different styles. 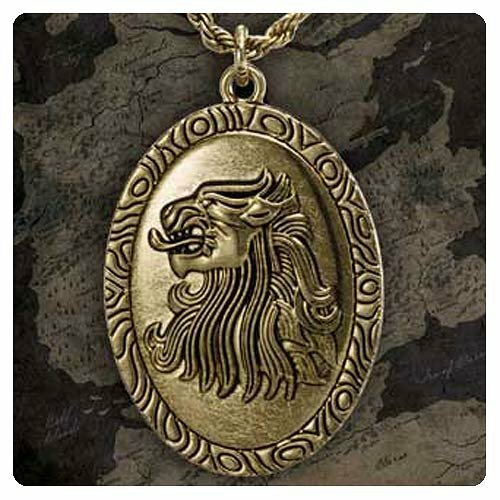 I’m quite traditional in my taste so the lion is my favorite of the two! Lastly, we have a couple of different throw pillows for you. 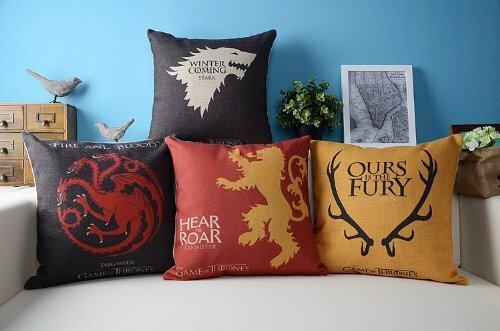 The 4 piece square pillow set is great value and features the designs of the four main Houses – Stark, Lannister, Targaryen and Baratheon. The shaped throw pillow is also available in the various House designs and colors but the red is my favorite design. If you have a gamer or geek to buy gifts for, don’t forget to pop back regularly or check out our Gifts for Gamers and Geeks Facebook page. You can leave a comment or a message if you’d like us to find some ideas for you – just leave a few details and we’ll scour the Internet to find some cool stuff for you.